Permission to ditch the treadmill, granted. Prone to injury? Read on. With a new year comes a swirl of new fitness trends, each one vying for the attention of the newly motivated and fitspo-hungry, though only a few carry the staying power to see out the year. In 2016, we saw HIIT, boxing and group fitness dominate and this month, new kid on the block, IRON ZUU is set to make a convincing entrance with its injury prevention approach to interval training. "It's a low impact 45-minute session with a 50-50 mix of dumbbell weights and high intensity movements," Nathan Helberg, founder of ZUU and creator of IRON ZUU told The Huffington Post Australia. 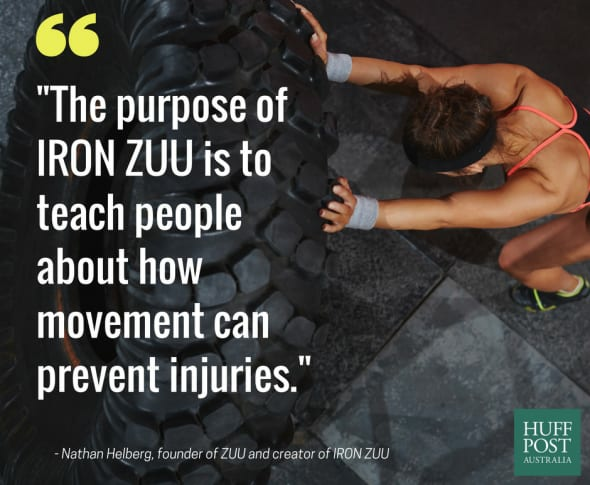 The purpose of IRON ZUU is to teach people how movement can prevent injuries by making mobility a top priority. "Most people who are doing weight training or traditional training don't have any knowledge about why movement is valuable to them," Helberg said. The first thing Helberg tells his clients? Quit the treadmill. "The cardio component that you can get through doing mobility work for example, bear crawls, beats hands down any cardio equipment because it's giving you freedom of movement while remaining low impact as opposed to running which is high impact," Helberg said. According to Helberg, traditional training like the rowing machine, treadmill and various weight machines are robbing people of their mobility. "We see this constantly when clients start to incorporate lateral movements into their workout and then complain of a stiff hip or back," Helberg said. Using dumbbells and a bunch of short burst movements like frog squats, bear crawls and conbras, Herlberg said you can expect to burn 1000 calories during the workout and another 1000 calories over the next 24 hours. As well as the calorie burn, Helberg explains there's more recruitment of muscle as a result of multiple joints moving. New muscles, new year, new you, right? The official launch day for IRON ZUU is happening January 21 on the Gold Coast before rolling out in all major Australian cities.